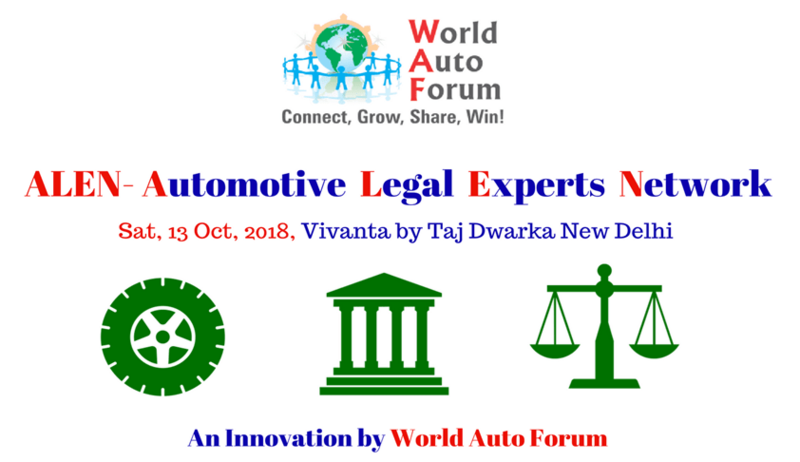 ALEN-Automotive Legal Experts Network is an innovation of World Auto Forum which will be held on October 13, 2018 at Hotel Vivanta by Taj, New Delhi. How to harness IP Protection in Automotive for Business and Competitive Advantage. The After Effective of GST: Learning, Challenges and Opportunities for Future. Leading General Counsels, CS, CFO’s, CEO’s at Auto Co’s. ALEN Delegate Pass: Rs. 4999 + GST 18% Discount: Flat 10% on 1 ticket , Flat 20% 2 Tickets, Flat 30% 3 Tickets, Flat 40% 4 Tickets & more.. Note:Students will carry their valid college I-Card.